How Kolkata Came To Be Calcutta — And Why It Went Back To Kolkata : Goats and Soda With Mother Teresa in the headlines, so is the name of the city where she lived for decades. But is it ... Calcutta? Or Kolkata? And what's the difference? 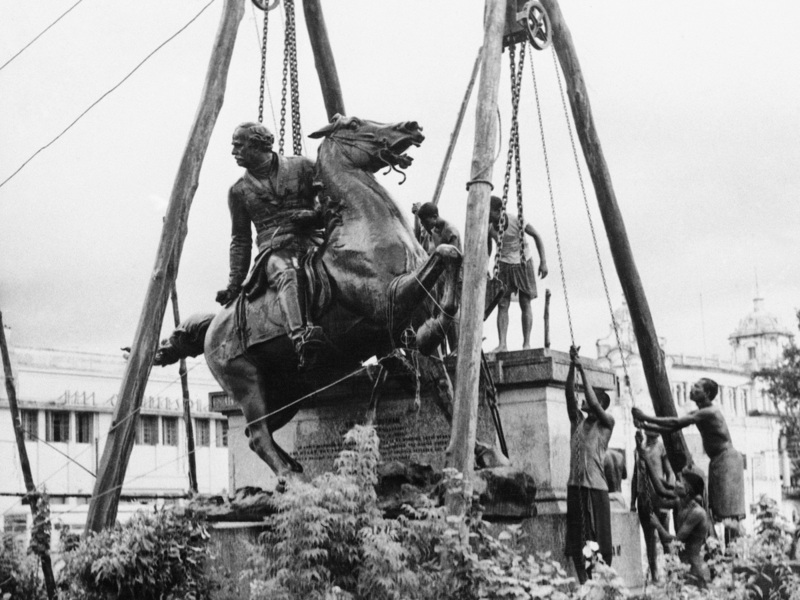 In 1957, the West Bengal government ordered the removal of the bronze statue of Gen. James Outram, a landmark in Calcutta. He was commander of the British forces during the 1857 Indian mutiny. When I moved from California to Calcutta in 2011, I would joke that I had merely exchanged one Cal for another. It was not technically true. Calcutta, the bustling metropolis where I was born, once the First City of the British Raj, had already rechristened itself as Kolkata in 2001. The British left India in 1947, but they left behind quite a bit of baggage — starchy clubs with antiquated jacket-and-tie dress codes completely unsuitable for Indian weather, a passion for cricket and English and Anglicized names. Every city had streets and squares named after English viceroys and governor-generals: Clive, Hastings, Dalhousie. Soon the new government was busy renaming those roads and landmarks after Indian freedom fighters. Lala Lajpat Rai. Tilak, Gandhi. Nehru. A lot of Gandhis and Nehrus. The author pronounces "Calcutta" and "Kolkata"
Kolkata was always called Kolkata in Bengali — derived from the name of one of the three villages said to have become the modern city of Kolkata. But the British called it Calcutta. I don't know why Calcutta rolled off British tongues more easily than Kolkata, but then I had American roommates who asked if they could call me Sandy instead of Sandip even though both names were two syllables. In 2001 the government of West Bengal decided to officially change its capital city's name to Kolkata to reflect its original Bengali pronunciation. It didn't really affect us much. We were used to calling it Kolkata in Bengali and Calcutta in English, and we switched between both names with as much fluency as we switched between those two languages. Other name changes were far more loaded — Bombay to Mumbai, Madras to Chennai, for example. The rejection of the British styling and the return to Indian roots was seen as erasing some of the cosmopolitan pasts of those cities, of favoring one linguistic group over another, of a rising tide of parochialism where some names tried to mark the true sons of the soil from names preferred by those who came from outside, even if that outside was just another state in India. It became an ideological statement to use one name over the other, a sort of linguistic version of planting your flag in the sand. But Calcutta became Kolkata with minimal fuss. And for many of its residents it remained both, just as it had always been. Of course, more politically correct visitors tripped all the time, trying to carefully enunciate Kolkata and putting the stress in all the wrong places. To make matters even more confusing, some institutions stayed Calcutta for reasons best known to them. The Calcutta Electric Supply Corp. gave Kolkata electricity. We studied at Calcutta University. The elite partied at Calcutta Club in a city served by the Kolkata Municipal Corp. And if anyone revives that famous Broadway production it will never be "Oh! Kolkata!" Also, many Kolkatans whose names had been Anglicized retained those surnames. The Thakurs still called themselves Tagore. The Mitras who had become Mitters stayed Mitter. It was a sort of pick-and-choose Anglicism. Now an even more dramatic name change is underway. Just this August the entire state of West Bengal decided to rechristen itself. West Bengal came alphabetically dead last in the long list of Indian states. The state's chief minister decided to leapfrog to No. 4 by simply dropping the "West." It actually made sense in practical terms. There is no East Bengal anymore. That's long been the independent country of Bangladesh. To add to the geographical confusion of hapless tourists, we were a West Bengal located in the eastern part of India. This time, however, there was more resistance. For many, the "West" in West Bengal was an emotive reminder that this state had once been partitioned by the British, that thousands had lost everything as they fled from one side to the other, as the eastern wing of Bengal became East Pakistan and eventually Bangladesh in 1971. In West Bengal, there was still great nostalgia and yearning for the lands left behind. The mango never tasted as good as the mango in the orchards in the east. The hilsa fish of West Bengal's Hooghly River was a poor cousin of the great hilsa cruising down the mighty Padma in the east. When I returned to Kolkata after my first visit to Bangladesh, the most common question I was asked was, "Did you have their hilsa? Is it as good as they say?" Time has made the longing even sharper. Dropping the "West" seems like wiping away that whole history, pretending it never happened. The name change has gone through the state government (though the national parliament in New Delhi has yet to ratify it). Now comes the fun part. Firmly believing in the adage "the more the merrier," the state will be called Bangla in Bengali, Bengal in English and Bangal in Hindi. That, of course, should mean that my home city should be called Kolkata in Bengali, Calcutta in English and Kalkutta in Hindi, but logic was never the strong point of governments. In the toxic fight over naming states, it's almost welcome that the new state of Bangla is open to different strokes from different folks. Bangla also happens to be the word for the local country liquor in these parts. Perhaps that's the secret to its nonchalance about its name. Bangla, Bengal, Bangal — it does not matter as long as it's not last call at the bar.